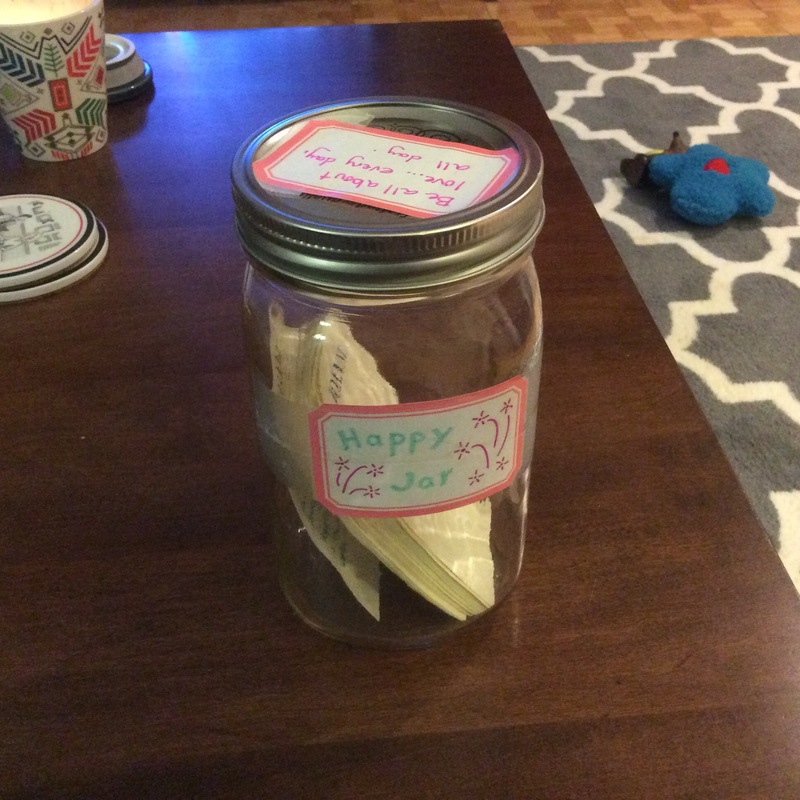 So, I started a project back in January, filling a jar with slips of paper. On each one, I wrote something happy about that day. Initially, I didn’t put in a lot of notes.As the year passed though, I found more and more things to be happy about. A good friend, Debra, contributed the first note, which reads, “Smile Allways!!!”. The rest are listed mostly by date (if I wrote it down). Patrick passed his first semester of cal with an 83! Woohoo! 2.8.15 Peanut loves me. I love him dearly. 2.9.15 Mom’s ultrasounds were good! Halleluhah! Such a blessing! 2.11.15 Made Valentines with Patrick & Emily. Watched Mount Vernon win in soccer 3-2! Joy! 2.16.15 Patrick is now passing ALL of his classes! Hurray!! 2.20.15 Patrick does not have a tonsillar abscess! Thank you Lord! 3.17.15 Mom’s shoulder is starting to feel better. 4.8.15 Patrick scored the winning goal against Galloway with 3:30 left on the clock! 2-1 final score! 4.10.15 Patrick went to his senior prom with Emily! So very special! My baby boy is so grown up. 4.13.15 Patrick scored two goals and had two assists! In the rain! On Senior Day! Joy!!! 4.14.15 Patrick is officially attending Belmont! Woohoo! 4.16.15 Patrick got 7 calculus assignments done tonight! 15 left! 4.23.15 Patrick finished calculus! Halleluhah! Woohoo! 5.16.15 Patrick graduated high school! 6.23.15 Patrick went to Belmont orientation! Vive la Nashville! 6.23.15 Bam went home from the hospital! Halleluhah! 7.7.15 Magic Mike XXL with Mom & Beebo! Too much fun! Bam’s lung cancer was caught in the earliest stage and is treatable! Halleluhah! 7.26.15 I made it home from Sweden! There’s no place like home! 8.17.15 Bam finished her radiation treatments! Halleluhah! 8.20.15 The BIG Day! Patrick goes to college! So proud of my Peanut! Dad does not have skin cancer! Thank you, God! 9.17.15 I fixed Bam’s email on her ipad and iphone today! More time with Bam! Joy! 9.22.15 Took Bam to the oncologist. She looks great! Breathing fine, feeling better! Blessings! 9.22.15 Dinner with Dianne! So blessed to have loving, wonderful friends! 9.24.15 Lunch with Susie! Cooked lots for Patrick too! 9.30.15 Mom and Dad are home! Had a great night with Coco! Watched (the new) Poltergeist and painted! 10.3.15 Patrick gave me a really sweet hug and kiss before he went back to school. Told me he is proud of me. Love him so much. 10.9.15 A big hug from someone special! Time with Bam and Papa! 10.20.15 Got caught in a hail storm on the trolley tour! Funny! 11.17.15 Bam’s tumor is dead or dying! HALLELUHAH!!! Thank God! 11.22.15 You are my always and my never. We will always love each other and never be together. 12.1.15 Watched Georgia Tech beat Wofford with Dad! Loved having time wiht him. 12.3.15 Fabulous day with Bam and Papa — even with a doctor visit! I love them so much! 12.4.15 Found out lots of people might want to buy my/our home! Good news! 12.5.15 Helped Bam buy a new sewing machine! Mom helped me shop for house stuff & clean out Goodwill stuff! 12.6.15 Amazing day! Ping pong table went to a good home! Tim and Casey helped move it AND my furniture! Mom and I had fun with David Bailey shopping at Nordstroms Phipps! 12.7.15 Thankful for good vets! Praying for my pups. Got so much done today! Carpets are clean, sofa is clean! Waiting for an estimate on pressure washing…he was an extra on the first Walking Dead episode! 12.8.15 Fabulous day with Mom and Jay looking at townhouses! Got 2 on my short list! 1 favorite! 12.9.15 I feel strong. I feel confident. I feel like no one can f*ck with me. I feel whole again. 12.10.15 I made the decision…moving to the town house near Bam and Papa. Looking forward to a fresh start! 12.11.15 Got to see Mom, Bam & Papa, Korey, Ruby, Jack et al! What a happy day! What a fabulous life! 12.12.15 The open house went well! Busy, busy day! Girls Night now! Can’t wait to see Coco Loco! 12.13.15 Today is Mom & Dad’s 30 year wedding anniversary! Gene became my dad! And I became his daughter! Other amazing news! I’m getting the town home! 12.12-13.15 Last night, I danced to “As” and poured out all my joy and thanks to God for healing Bam, Mom and Dad. Incredible blessings! 12.13.15 I did something that took a lot of courage. Moving on is hard to do if you keep dragging baggage along with you! Jettisoned! 12.14.15 Took Bam to see Dr. Nowlan. He takes such good care of her. What a blessing! We had Figo for lunch — Papa had Chick-fil-A. 12.15.15 Mom and I shopped for three families for Georgette’s WH folks! Always fills us with Christmas spirit! 12.16.15 Mom and I got to spend the day together–on her birthday! Greatest gift ever! Most wonderful mom! 12.17.15 We did the walk through today! Bam had a great visit with Dr. Lock today. Best numbers ever! 62%! What a blessing! 12.18.15 Patrick and Emily helped me deliver the gifts to the Waffle House families! It is so much more gratifying to give than to receive! We love sharing our blessings! 12.19.15 Mom and Dad made it possible to help a young single mom living in her car get an apartment (for her and her 8 year old son). Blessed to share the blessings! 12.19.15 It made me so happy to be able to kiss Patrick on the cheek when he went to sleep. Glad he’s home from college. I miss him far too much. I love him endlessly. 12.21.15 So happy to see Susie again today! She’s such a swetheart and I love thier pups too! Makes me so happy for Patrick to have their love and support! 12.22.15 Closed on the new home today! What a blessing, in many ways. Went for a fog-drenched walk at night. So peaceful. Got good news that neither pup needs heart meds! 12.23.15 Helped Kai and Christan shop for toys at Target (they are from Calvary Childrens Home). Deep, bittersweet delight. They are such precious kids. Made me miss Peanut at that age so much. 12.24.15 Christmas Eve service with Mom, Dad, Boo, Patrick, Andy , Mr. Heaton and Alex. Then dinner with them all AND Hadley, Matt and Reynolds (and Emily). Patrick is staying at home tonight. We watched the Golden Girls. A very Merry Christmas! 12.25.15 Merry Christmas! A lovely day with Mom, Dad, Patrick, Gene and Andy. Veggie soup and A Christmas Story with Patrick! 12.29.15 Looked at new furniutre! So exciting! Finished ordering all my light fixtures! 12.30.15 Beyond blessed to have a loving son and an amazing friend. You remind me that goodness, love and beauty can exist even amid the chaos, evil and darkness. And blessed to have a wonderful family! 12.31.15 (Not on a note…btw) Happy New Year, Everyone! I hope your 2016 is full of peace, joy and happiness! This entry was posted in Bam, Christmas, Cyndi, Family, grandfather, grandmother, holidays, love, Mom, Uncategorized and tagged 2015, Bam, blessings, Dad, Emily, Family, Happy Jar, Love, mom, new beginnings, new perspective, Papa, Patrick. Bookmark the permalink.